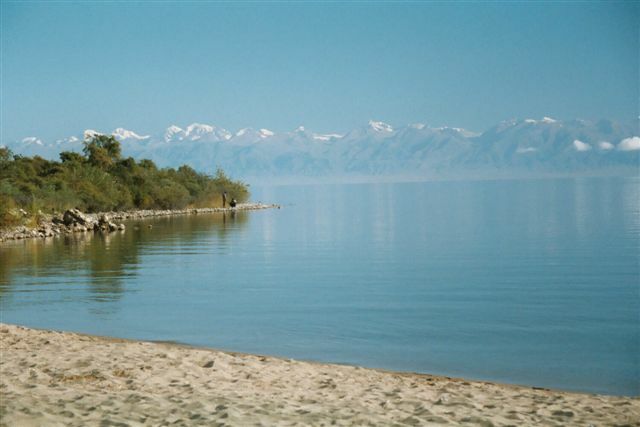 This peaceful, serene waterscape in Kyrgyzstan holds for me at least two interesting facts. Not that the water is said never to freeze, despite the lake being surrounded by snow-capped mountains (although that is kind of interesting). Or that the shores of the lake are full of health resorts (although this will become ironically interesting soon). I’m mostly interested in its connections to plague (see?) and drowned cities (you can make you’re own guesses as to what kind of story I’m working on right now). Historians think that Lake Issyk Kul, being a popular stopover point on the Silk Road in medieval times, was the place from which the Black Death swept through Europe and Asia with devastating effect in the fourteenth century. Merchants and travellers would come into contact with each other as they paused to rest along the route, picking up additional plague-carrying fleas or flea-ridden rats – not intentionally of course. They would then continue on their journey, bringing the sources of pestilence with them. Legends around Lake Issyk Kul mention several drowned cities; archeologists in 2007 were excited to find the remains of a 2,500- year-old bronze age walled city hidden at the bottom of the lake. Some of the items retrieved included the world’s oldest existing coins.